The function tool Set Ground is used to change the assignment of the "GND" node. When this function is enabled, selection of a net in the circuit removes the previous assignment and assigns the selected net as "GND" node. This option may be used to delete ground node assignment. Enables to force desired digital nets or I/O pins to high/low logic states, high impedance state, etc. Allows to create logic state generators that forces desired digital nets or I/O pins to varying states with respect to time. Allows to force desired digital nets or I/O pins to high logic level. Allows to force desired digital nets or I/O pins to low logic level. Allows to force desired digital nets or output pins to high impedence state. Allows to force desired digital nets or I/O pins to unknown state. Allows to force desired digital nets or output pins to rising edge. Allows to force desired digital nets or output pins to falling edge. To create testpoints defining voltages or current that can be displayed as waveforms after the analysis. Allows to create testpoints defining net voltages that will be shown on the diagram. Up to 8 Voltage waveform testpoints may be created. Allows to create testpoints defining component pin currents that will be shown on the diagram. Up to 8 Current waveform testpoints may be created. Allows to create testpoints defining digital nets and I/O pins for which logic states will be shown on the diagram. 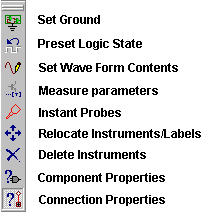 Up to 32 logic state waveform testpoints may be created. A window “Measure Parameters” that allows to define the parameters whose values are to be determined and displayed after the analysis. To display the result of transient analysis of desired nets/nodes in the circuit. Before applying this tool in analog or digital circuit, transient analysis settings have to be made. For this, choose Transient Analysis from Simulation menu -> Analysis. 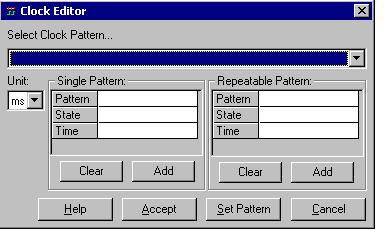 The simulation time limit and step time are specified in the parameter set up window. Finally run the analysis after accepting the changes. Allows to move testpoints or markers attached to points within the circuit. Enable this option and click on the testpoint/marker to be relocated and the testpoint can be moved to the required location. To delete instruments or testpoints added to the current circuit. Choose this option and click on any testpoint or instrument to be deleted. A confirmation box pops up to proceed deletion. This opens a list of option tools that enables to assign/change values of circuit elements present in the schematic, to change the simulation parameters, to reassign spice model parameters and to add/edit text for elements.